One of the annual highlights of the Keeneland fall meet is the $500,000 Queen Elizabeth II Challenge Cup Stakes (gr. I), a nine-furlong race that pits some of the best three-year-old turf fillies against each other in a race that often serves as a prep for the Breeders' Cup Filly & Mare Turf. 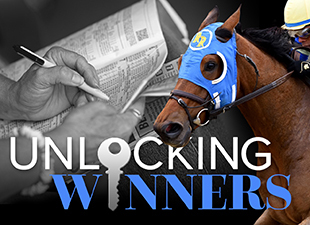 The 2017 edition of the race promises to be particularly competitive and exciting thanks to a large field filled with proven graded stakes winners. The favorite could wind up being New Money Honey, who races for the powerful team of trainer Chad Brown and jockey Javier Castellano. Last year, the daughter of Medaglia d'Oro won the Miss Grillo Stakes (gr. III) and Breeders' Cup Juvenile Fillies Turf (gr. I) with sharp rallies from mid-pack, and she's shown a bit more speed this year while winning the Wonder Again Stakes (gr. III) in gate-to-wire fashion and the ten-furlong Belmont Oaks (gr. I) from just off the pace. You really can't knock New Money Honey's turf form, and her fifth-place finish on dirt in the Alabama Stakes (gr. I) last time out is excusable, but there might be a couple of reasons to play against her on Saturday. First off, her odds are bound to be on the low side since she's trained by Chad Brown, but Brown doesn't win with quite the same frequency in Keeneland's major turf races as he does in New York. According to stats from DRF Formulator, Brown is just 8-for-54 (15%) over the last five years in graded stakes races on turf at Keeneland, with an ROI of just $1.24. Over the last two years, his record drops to 2-for-27 (7%) with a $0.97 ROI. Secondly, New Money Honey has drawn the far outside post position in a large field, which could potentially lead to a wide trip unless she guns for the lead from the start. This by itself might not be a reason to play against New Money Honey, but coupled with her presumably low odds, I'm tempted to take a shot with someone else on top. In my opinion, the most intriguing filly in the race is Proctor's Ledge. Trained by Brendan Walsh, the daughter of Ghostzapper showed great promise winning a couple of races at Gulfstream last winter with terrific late rallies, and following three decent efforts in graded stakes company at Keeneland and Churchill Downs, she really blossomed during the summer at Saratoga. Two starts back, she overcame a modest pace to rally and win the Lake George Stakes (gr. III) in decisive fashion, and last time out she unleashed a similarly impressive turn-of-foot to win the Lake Placid Stakes (gr. II) over a course labeled "good." According to data from Trakus, Proctor's Ledge ran the fourth quarter-mile in :21.87 and the final furlong in :11.29, sensational fractions that demonstrate just how powerful her stretch runs can be. Of course, if I like Proctor's Ledge, then I must by extension like Uni, a Chad Brown-trained filly that finished even faster than Proctor's Ledge while rallying for second in the Lake Placid Stakes. Whereas Proctor's Ledge has run since then and will enter the Queen Elizabeth II Challenge Cup off a two-month layoff, Uni came back to win the Sands Point Stakes (gr. II) at Belmont Park, staying a bit closer to the early pace before finishing strongly in the final furlong to win by a neck. Like her stablemate New Money Honey, she's drawn very wide in post position ten, though as a deep closer she's less likely to be affected by the wide draw. An interesting new face in the race is Wuheida, who ships in from Europe for trainer Charles Appleby and Godolphin Racing. The daughter of Dubawi went 2-for-2 last year, culminating with a win in the Group 1 Prix Marcel Boussac at Chantilly, and while she's yet to win this year, it's not from lack of trying. Wuheida has competed exclusively in Group 1 races this year, finishing second in the Falmouth Stakes against older mares, third in the German Oaks at a distance that might be beyond her best, fourth in the Matron Stakes behind the high-class fillies Hydrangea and Winter, and fourth by just a half-length behind Rhododendron and Hydrangea in the Prix de l'Opera just two weeks ago. Suffice to say, no filly in this race has kept better company this year than Wuheida, and all things being equal she's surely the filly to beat. Then again, she's shipping to North America on short rest, racing on Lasix for the first time, and tackling a tight-turning seven-furlong U.S. turf course for the first time. Can she adapt to the change in conditions? And will her odds be high enough to warrant the risk? As you can see, there are plenty of fillies to consider in this race, and I haven't even mentioned the multiple graded stakes winners La Coronel and Madam Dancealot, the German classic winner Unforgettable Filly, Kentucky Oaks (gr. I) runner-up Daddys Lil' Darling, the Del Mar Oaks (gr. I) 1-2 finishers Dream Dancing and Beau Recall, or the stakes winner and Royal Ascot star Con Te Partiro. A case of some sort can be made for everyone, but I'll try to keep things simple and favor the chances of Proctor's Ledge and Uni, with a preference for the former since she has drawn well in post position two and may work out an ideal ground-saving trip. Proctor's Ledge has shown flashes of major talent since her maiden win at Gulfstream, and I'm going to play her to win right back, with the Brown fillies and Wuheida being the key players for the exotics. Now it's your turn! Who do you like in the Queen Elizabeth II Challenge Cup?